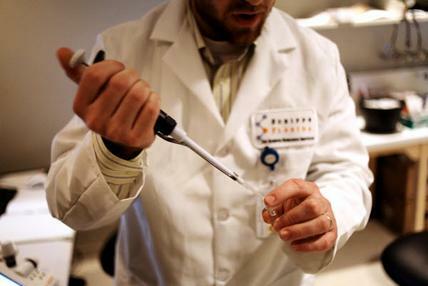 Florida lawmakers have invested $1.5 billion in Scripps, nearby Max Planck Florida, and six other biotech research centers that officials say have created 1,100 jobs. “If it’s only 1,100 jobs, it doesn’t seem like it panned out too well,” Senator Gwen Margolis, D-North Miami Beach… Adding that’s more than $1 million per-job. The state’s last payments to Scripps — totaling $50 million — are scheduled to occur over the next two years. A senior research associate at The Scripps Research Institute, prepares a saline solution before examining the brains of fruit flies... Yes, they are cutting the budget on our public services and environmental protections across Florida to fund the study of fly brains. Really. “[T]he biotech industry is not the economic savior it’s often made out to be, cautions Portland-based economist Joseph Cortright, who co-authored a widely-read 2002 Brookings Institution report on biotechnology and its job-creation prospects. Read the rest of the Miami Herald story here. 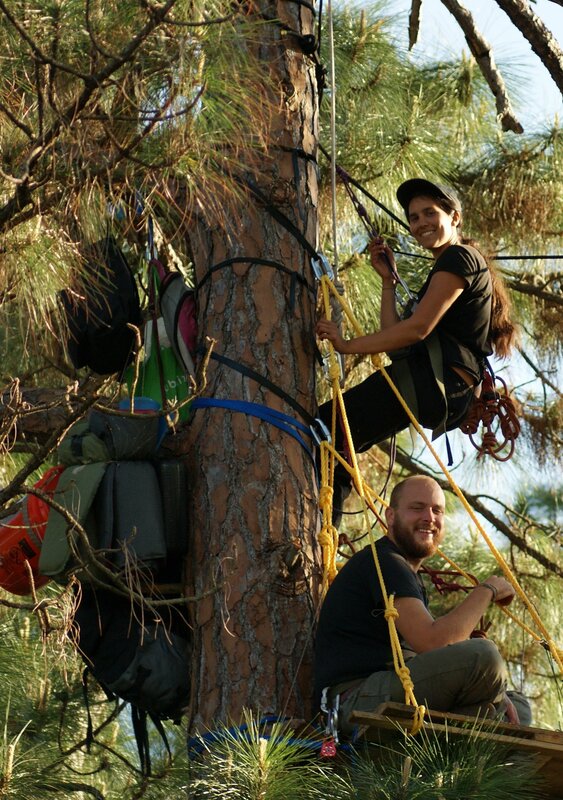 Tree sitters Arrested, More Trees Cut… Struggle Continues! 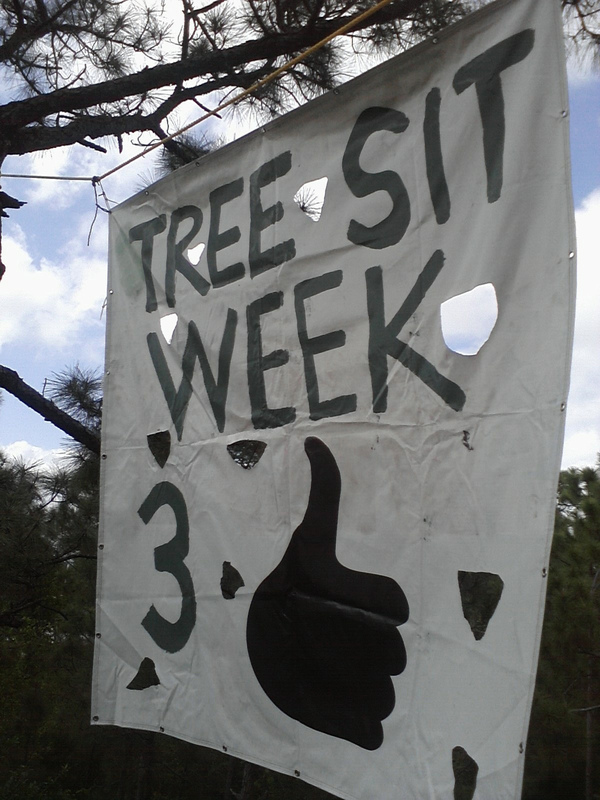 Slash Pine trees cut by Palm Beach Gardens in Briger Preserve area to remove tree sitter's banners. After arresting two tree sitters along Donald Ross Road, Palm Beach Gardens Police admitted to cutting multiple trees in the Briger forest, including trees in areas designated as a “preserve” in development permit, as well as an area of public land, owned by the residents of Palm Beach County. The arrests have resulted in news stories across the country, and an upsurge of public support. 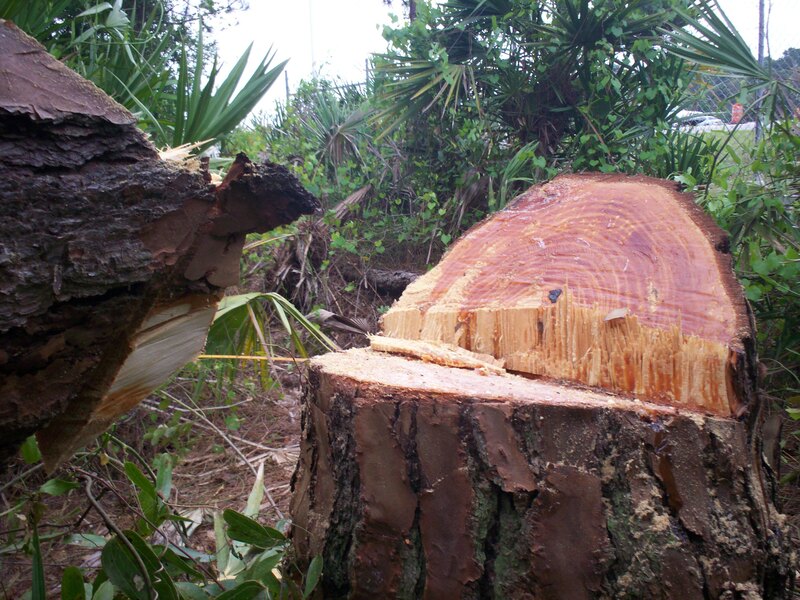 We lament the loss of these trees—among the last remaining mature native Slash Pine in all of south Florida’s eastern corridor—and we commit to making this the rallying call to end the Scripps Biotech plan before any more endangered species habitat is lost to the forces of corruption and greed. MARCH 14: One Month Rally for the Briger Forest Tree Sit! Occupying the proposed site of Scripps. 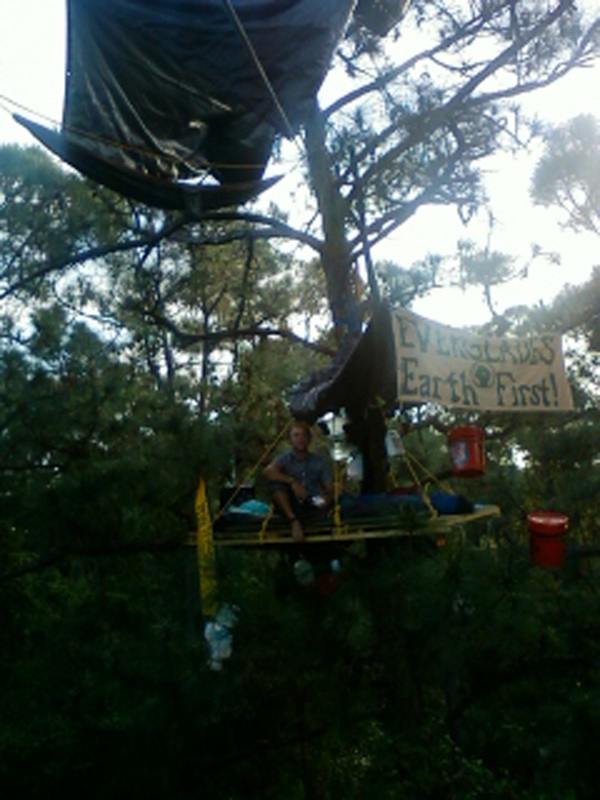 Monday, March 14th, 2011, marks one month of occupying the canopy of Briger forest in opposition to the Scripps Phase II expansion plans. JOIN US! We will be meeting to rally at the corner of Donald Ross and Parkside, 4pm-6pm, across from FAU and Abacoa. Please being signs and banners, drums and noise-makers, friends and families. We will also be collecting donations of non-perishable food and financial support to continue sustaining the tree sit. 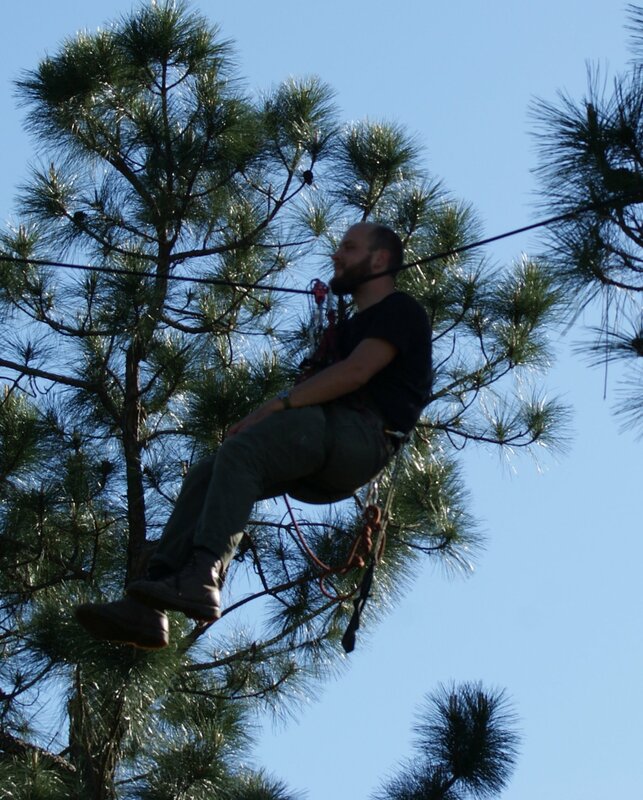 Click here to check out video from inside the tree sit. For more background on the campaign, check out the new FAQ section of this website. A new banner appears, subverting the "No on 4" campaign logo in honor of the fight for Hometown Democracy on the Florida ballot last election, which if passed, would have required a public vote on the land use decision for the Briger forest.